Gorgeously romantic, these stunning drop earrings are crafted in luxurious 18ct white gold. Set with dazzling diamonds totalling 0.45ct, Vera Wang's signature sapphire is featured, a brilliant symbolic gesture of how love can capture the heart. 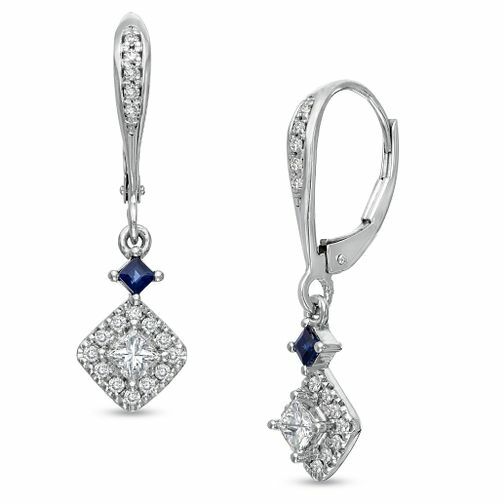 Vera Wang 18ct White Gold 0.45ct Diamond & Sapphire Earrings is rated 5.0 out of 5 by 1. Rated 5 out of 5 by Anonymous from Vera wang 0.45ct 18k white gold drop earrings Absolutely perfect. Every single person who sees them is blown away. Looks beautiful with the diamonds at the top, with centre diamond surrounded by more diamonds! Sapphires give a great contrast. My fiancée says they are easy to put on and take off by yourself. they look great in the matching set with the 0.37ct pendant and the 2.0ct halo ring.